China is comfortable with the idea that the law of the sea is sacrosanct, and that Beijing can carve out a zone of exception for itself. Senior Colonel Zhou Bo set China-watchers atwitter last week when he informed a group including Admiral Samuel Locklear, big kahuna of the U.S. Pacific Command, that the PLA Navy has "sort of reciprocated America’s reconnaissance in our EEZ by sending our ships to America’s EEZ for reconnaissance." One meme making the rounds among the punditry holds that Beijing has now conceded the U.S. interpretation of what sorts of activities are permitted in a coastal state's exclusive economic zone (EEZ). That interpretation affirms that the swathe of EEZ lying beyond the coastal state's territorial sea and contiguous zone is the high seas. Flight operations, reconnaissance, and other routine military activities may proceed there unencumbered. To all appearances a kind of doublethink is at work here. Doublethink, of course, is a term coined by George Orwell to describe someone's capacity to hold two mutually contradictory ideas simultaneously without cognitive dissonance's exposing the contradiction. Despite the plain meaning of the UN Convention on the Law of the Sea (UNCLOS) text, Chinese officials appear entirely comfortable both with the idea that the law of the sea is sacrosanct, and that China can carve out a zone of exception for itself along its historic periphery at smaller neighbors' expense. China's prerogatives long antedate UNCLOS; ergo, they supersede the treaty language whenever the treaty works against Beijing's special prerogatives. This is the Newspeak in which officialdom couches its pronouncements. More likely, the PLA Navy's sort-of-reciprocating within the American EEZ is a function of power politics, not some belated admission that UNCLOS really, truly means what it says. 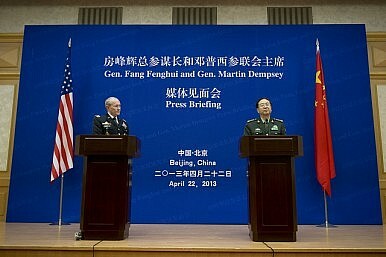 U.S. forces operate off China's shores, therefore Chinese forces must reply in kind. If Beijing now discovers that the law of the sea applies to its neighbors as sovereign equals, and withdraws all units from places like Scarborough Shoal and Mischief Reef, and renounces its claim to "indisputable sovereignty" over most of the South China Sea, then progress may be in sight. The Naval Diplomat would be delighted to be proved wrong about this. But me thinks wagering on such a volte-face remains a fool's wager. Should America ‘Spread the Theater’ in Asia? In applying a football metaphor to the Indo-Pacific the US Navy ought to ask itself some hard questions.